The limit cannot be configured and has a bizarre maximum of 800 characters for the first message and 8000 characters for subsequent messages to the same recipient. What? Why? How? Confusion and frustration ensues. 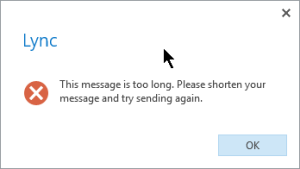 I actually enjoy using Lync but this one unresolvable minor irritation is spoiling the entire experience every time I want to share text with my colleagues.